Immunomedics stock gets halved in July following disappointing late-stage results from its licensing partner. 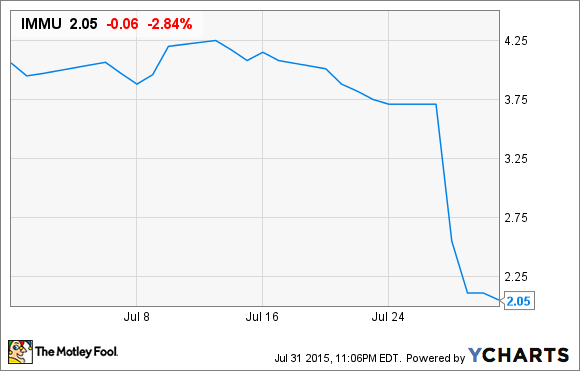 Can Immunomedics pick up the pieces and move on, or is it lights out for this drug developer? Shares of Immunomedics (NASDAQ:IMMU), a biopharmaceutical company primarily focused on treating cancer as well as autoimmune diseases, were decimated in July with its stock falling 50%, per S&P Capital IQ, after its licensing partner announced unfavorable top-line data from the phase 3 EMBODY trials involving epratuzumab. According to Belgian-based pharmaceutical company UCB, its phase 3 studies involving epratuzumab for the treatment of lupus (officially systemic lupus erythematosus, or SLE), a drug that UCB had licensed from Immunomedics for all autoimmune disorders, failed to reach its primary endpoint of statistical significance in either of its two tested doses versus the placebo. As of now, UCB hasn't decided what it plans to do with epratuzumab, but with additional SLE products in its own pipeline, it would appear unlikely that UCB is going to attempt to further develop the currently experimental monoclonal CD22-targeting antibody. For Immunomedics it's especially bad news since epratuzumab for SLE was its most advanced compound. Epratuzumab is also being tested in a midstage investigator-sponsored trial as a treatment for follicular lymphoma and acute lymphoblastic leukemia. Following the disappointing trial results, research firm Jefferies took out its shears and gave Immunomedics' price target a major haircut from $6 to $2, while also cutting its rating from "buy" to "hold." As you might imagine, that downgrade and price target cut didn't help Immunomedics' stock one bit. The question that investors have to wonder here is whether or not the sell-off in Immunomedics was a bit much considering the expected loss of epratuzumab as a treatment for SLE. On one hand, Immunomedics has a pretty rich pipeline for a company valued around $200 million. It's currently working with more than a half-dozen phase 1, or phase 1/2 studies involving either its monoclonal antibody milatuzumab, which targets the CD74 antigen, or its antibody-drug conjugate and immunotherapy line. There's a lot of promise with these early stage compounds, but we should still remember that they are early stage and years away from making an impact on Immunomedics' top- and bottom-line. Also, Immunomedics still has five hopeful later-stage candidates across a number of oncology indications. Then again, Immunomedics' $106.2 million in cash and cash equivalents only gives the company a two- or three-year cash runway based on the nearly $40 million in operating cash outflow it experienced over the prior 12-month period. It's possible the company could monetize its drug development platform to raise additional funds, but a late-stage failure isn't going to help its cause in that regard. For extremely high-risk investors that have a passion for biotech and understand they could lose a substantial portion of their investment, I believe Immunomedics could be worth a nibble here. If anything, it's shown an ability to develop clinic-worthy compounds at a rapid pace, and that type of information could be worthwhile to larger pharmaceutical companies. Of course, there's a big risk here if Immunomedics struggles to monetize its platform, or worse, if its midstage studies don't translate into late-stage success. I would suggest approaching an Immunomedics investment with cautious optimism, but believe its diverse pipeline favors modest upside over downside in the intermediate term.